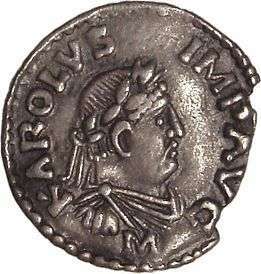 Charles III (17 September 879 – 7 October 929), called the Simple or the Straightforward (from the Latin Carolus Simplex),[lower-alpha 1] was the King of West Francia from 898 until 922 and the King of Lotharingia from 911 until 919–23. 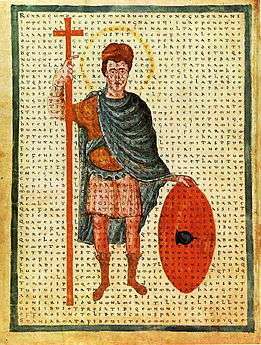 He was a member of the Carolingian dynasty. In 893 Charles was crowned by a faction opposed to the rule of Odo at the Reims Cathedral, becoming monarch of West Francia only after the death of Odo in 898. In 911 a group of Vikings led by Rollo besieged Paris and Chartres. After a victory near Chartres on 26 August, Charles decided to negotiate with Rollo, resulting in the Treaty of Saint-Clair-sur-Epte which created the Duchy of Normandy. In return for the Vikings' loyalty, they were granted all the land between the river Epte and the sea, as well as Duchy of Brittany, which at the time was an independent country which East Francia had unsuccessfully tried to conquer. Rollo also agreed to be baptised and to marry Charles' daughter Gisela. 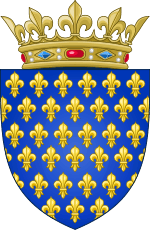 Also in 911, Louis the Child, the last Carolingian king of East Francia died, and nobles of Lotharingia, who had been loyal to him, under the leadership of Reginar, Duke of Lorraine declared Charles their new king, breaking from East Francia which had elected non-Carolingian Conrad I as the new king. 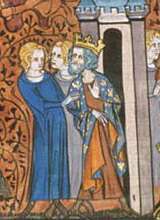 Charles had tried to win Lotharingian support for years, for instance, by marrying in April 907 a Lotharingian woman named Frederuna, and in 909 his niece Cunigunda married Wigeric of Lotharingia. Charles defended Lotharingia against two attacks by Conrad I. 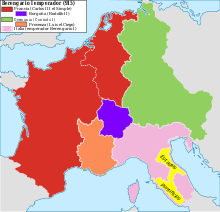 In 925 Lotharingia was once again seized by East Francia. By this time Charles' excessive favouritism towards a certain Hagano had turned the aristocracy against him. He endowed Hagano with monasteries that were already the benefices of other barons, alienating them. In Lotharingia he earned the enmity of the new duke Gilbert, who in 919 declared loyalty to the new king of East Francia Henry the Fowler. Opposition to Charles in Lotharingia was not universal, however; he retained support of Wigeric. In 922 the Frankish nobles revolted again led by Robert of Neustria. Robert, who was Odo's brother, was elected king by the rebels and crowned, while Charles had to flee to Lotharingia. On 2 July 922, Charles lost his most faithful supporter, Herveus of Reims, who had succeeded Fulk in 900. Charles returned with a Norman army in 923 but was defeated on 15 June near Soissons by Robert, who died in the battle. Charles was captured and imprisoned in a castle at Péronne under the guard of Herbert II of Vermandois. Robert's son-in-law Rudolph of Burgundy was then elected to succeed him as king. On 6 December 884 King Carloman II of West Francia died without a male heir and his half-brother, the future Charles the Simple, was just a five-year-old boy. Because of this, their cousin Charles the Fat, already Holy Roman Emperor and King of East Francia, was invited by the nobles of the Kingdom to assume the throne. Since the beginning, the new monarch was forced to deal with constant Vikings raids, with little success. After three years of incompetent government, Charles the Fat was finally deposed by the Diet of Tribur in 887. Faced with the growing threat of northern invaders, the local nobles again rejected the succession of Charles the Simple because he was too young, and Odo, Count of Paris (member of the Robertian dynasty) was chosen as the new King of West Francia, after successfully defending Paris against the Vikings, led by Rollo. In 893, aided by Archbishop Fulk of Reims, Charles the Simple attempted to reclaim the throne, but in vain. By 897 the young prince ruled only the city of Laon before Odo on his deathbed designated him as his successor. From 920 to 922, Charles the Simple was in trouble. Although he pacified his relations with king Henry the Fowler of East Francia, he had to fight on two fronts: one against Duke Giselbert of Lotharingia and the other against Hugh the Great, irritated by the treatment of his mother-in-law. 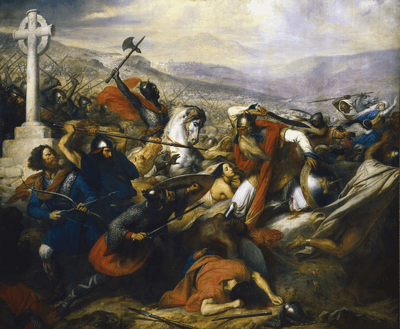 Defeated, in June 922 Charles the Simple took refuge in Lotharingia, and the nobles of the West Francia declared him deposed from the throne, choosing as the new King Robert, Count of Paris, brother of the late King Odo and father of Hugh the Great. During the summer Charles the Simple was captured by Herbert II, Count of Vermandois (another son-in-law of King Robert) at Château-Thierry; meanwhile, King Henry I of Germany took advantage of the situation to seize and add Lotharingia to his domains, after giving his daughter Gerberga of Saxony in marriage to Duke Giselbert. After some time at Château-Thierry, the humiliated Charles the Simple was transferred in 924 to Péronne, where he died on 7 October 929 and was immediately buried in the local Monastery of Saint-Fursy. The legitimate Carolingian heir was now the eight-year-old Louis, but King Rudolph retained the throne and ruled until his death from illness on 15 January 936 at Auxerre, being buried in the Abbey of Sainte-Colombe of Sens. The nobility then discussed who could be the next King, because Rudolph had died without surviving male heirs. Finally the nobles unanimously summoned back Louis, thanks to the decisive support of Hugh the Great to France to become their new King. ↑ His nickname 'simplex' or the simple is misleading. The Latin 'Simplex' was given to him meaning straightforward as in loyal or without guile. The nickname 'the Simple' has stuck with him even though its meaning has been corrupted. He was not, however, generally complimented by the chroniclers. He was called Charles the Stupid by a later chronicler for an incident in 919 where he abandoned his men. Besides this, he was called stultus (fatuous), hebes (stupid), insipiens (foolish), parvus (small) and minor (inferior). ↑ John E. Morby, "The Sobriquets of Medieval European Princes", Canadian Journal of History, 13:1 (1978), p. 6. 1 2 3 4 Michel Parisse, "Lotharingia", The New Cambridge Medieval History, III: c. 900–c. 1024, ed. Timothy Reuter (Cambridge: Cambridge University Press, 2005), 313–15. ↑ Genealogiæ Comitum Flandriæ, Witgeri Genealogica Arnulfi Comitis MGH SS IX, p. 303. ↑ Jean Dunbabin, "West Francia: The Kingdom", The New Cambridge Medieval History, III: c. 900–c. 1024, ed. Timothy Reuter (Cambridge: Cambridge University Press, 2005), 378–79. ↑ Depreux 2002, pp. 128-129. ↑ Depreux 2002, pp. 131-132. ↑ Richer de Reims: Gallica Histoire de son temps Book I, p. 87. ↑ Toussaint-Duplessis: Annales de Paris. Jusqu'au règne de Hugues Capet, 1753, p. 201.